The Sony XBA-4 Prestige earphones certainly aren't the cheapest in-ear headphones around but does the on-board tech justify the rather steep price tag? Sony has been a fixture in the audio market for ever, but high-end audio challengers such as B&W, Bose and B&O are constantly in danger of surpassing the Japanese giant. However, Sony has a plan, and the XBA range is it. Going up against the likes of the Sennheiser IE 80 and the Klipsch X10i, can the XBA-4s make it into our best headphones list? 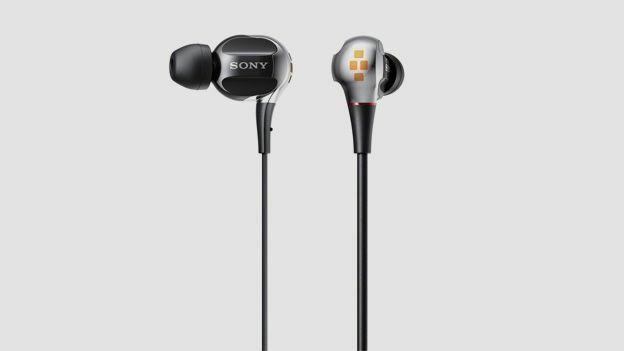 The Sony XBA-4s are the top end of Sony's 'prestige' XBA headphone line, launched at CES 2012, and their key USP is that they feature not a standard one, two or even three drive armatures, but an industry-leading four balanced drive units. Each ear gets the benefit of a full-range driver, woofer and tweeter plus an additional super-woofer for extended sub-bass. The immediate downside of this plethora of armatures is that they're not insignificant in size, weight (eight grams) or price - £299. However, in spite of the salty price tag, there's a lot here to like. The noise-isolation properties of the in-ear design are excellent, and with four sizes of soft hybrid silicone earbuds these fitted our lugholes brilliantly, and sat well in spite of their weight. Four balanced armatures is an impressive spec for consumer earphones, being far more akin to studio monitors for pro musicians, and this dichotomy unfortunately makes its presence felt in the sound. The XBA-4s sound very true – it's a flat, almost clinical sound that got professional musicians excited, but for casual use on our commute it's almost too much. With no colour being added by the phones it's down to your source to provide it, and most phones and MP3 players simply aren't up to the job, and far less capable of providing uncompressed quality to make these headphones shine. Bass is especially lacking when using a mobile setup, and it's only when hugely inflated or via a decent separates system that the quality shows through and the super-woofer's presence is really felt. Technically we're talking 108db/mW sensitivity and a sound range of 3-28,000Hz, which isn't bad at all. The rest of the setup oozes quality too, with a 1.2m oxygen free copper cable linking the phones to a gold-plated L-shaped jack. The jack itself is a study in quality design, and also performs the function of reducing and spreading stress to prevent cable failure. Meanwhile a leatherette, lined, magnetic latched hard case provides excellent protection – when you actually bother to use it. The Sony XBA-4's are addressing a specialised market given their price bracket, and aside from their sheer spendiness they're a brilliant headphone. Possibly too clinical for some tastes, and bear in mind they will expose your phone's 62kbps torrent collection as the over-compressed crap it is. That said, nobody else in that tube carriage will be sporting these – what price exclusivity?